A simple act like singing a song can unite people, even if they’re on opposite sides of the globe. Tiger Cub Scout Jahnav Bhatnagar and his dad Anuj found that out when they organized a Skype call between their pack in Phoenix, Arizona, and a home for girls in India. Anuj’s parents, Joti and Sheela, started an institute called Sheela Bal Bhavan in 1992 to help destitute and abandoned girls in Jaipur, a city of more than 3 million people in northern India. Anuj’s family visits every few years; Jahnav though was a little bummed leading up to this most recent visit. Cubmaster Kirk Stauff offered to handle the call at the meeting, installing a large screen for the Scouts of Pack 6 to see and interact. Jahnav suggested the children not only greet each other, but sing a song together. “It sounds daunting at first, but an event like this can fall into place so easily and have a long-lasting impact,” Anuj says. When Scouts met for the evening pack meeting, it was 7:30 a.m. in Jaipur, India. After morning prayers, Jahnav rallied the girls together, so the two groups could connect via the video chat app on a laptop. The Scouts in Arizona sang a song; the girls in India sang two — one in English and one in Hindi. The pack taught the girls how to sing “Boom Chicka Boom,” which the two groups then sang together. “Since India is halfway across the world from Arizona, this was truly a song sung across the world,” Anuj says. The call prompted discussions afterwards, including how Scouting is a global movement; two of the children at Sheela Bal Bhavan are Scouts. Jahnav later led the kids at Sheela Bal Bhavan in some games and shared what life was like in Arizona. Organizing the Skype call qualified Anuj, Jahnav and Kirk to receive Messengers of Peace patches, which can be sewn on the uniform around the World Crest. The personal dimension: harmony, justice and equality. The community dimension: peace as opposed to hostility or violent conflict. Relationships between humankind and its environment: security, social and economic welfare, and relationship with the environment. Some project ideas include donating to a charity, volunteering at a recycling center and creating a prayer garden. And yes, Hornaday Award and Eagle Scout projects also count. Just submit it through the Journey to Excellence site. 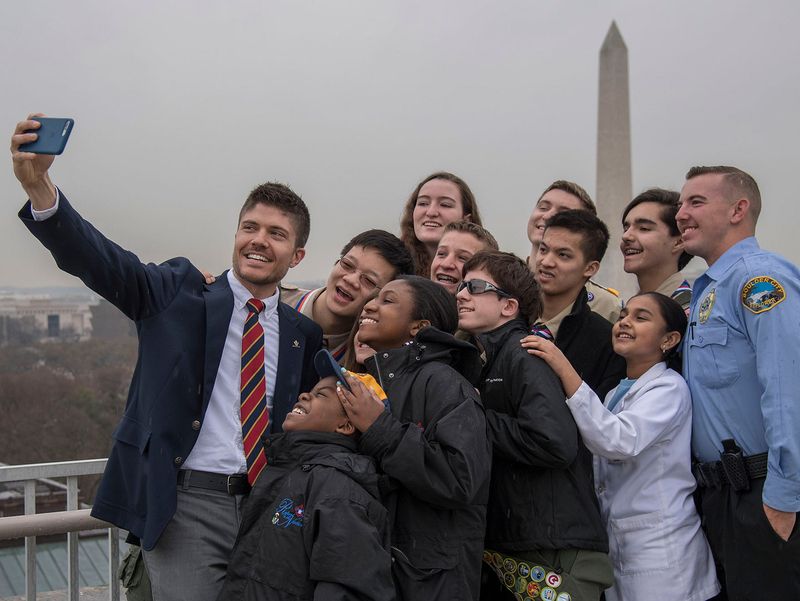 You’re also encouraged to share your project on the Messengers of Peace site or at international@scouting.org with the subject line of “Messengers of Peace.” That way, you can help inspire Scouts around the world with ideas on how they can positively impact their communities, too.